This poem is Part 27 in Esther Hyams’ series of poems which tell the life story of Anne Boleyn. 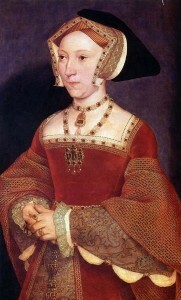 This time to the demure and pale-faced Jane Seymour. In September 1535, on the Seymour’s he did call. Henry stayed for a week; his fancy for Jane was quite keen. What may have been fleeting was a new passion, now begun. Just as Anne’s sensual seductiveness had once been so entrancing. And with her family history of boys, what joy she could bring. With light angel-blond hair so different from the dark Anne’s harm. Considered a perfect queen consort, with no bewitching pretension. Unlike Anne Boleyn who had once been the fascinating outsider. One Mistress was an angel of light, one considered a queen of the dark. Jane was thought an angel, and Anne was thought a bewitching devil.